I'm just back from the in-laws' where we spent a glorious Thanksgiving and am far behind on life in general. 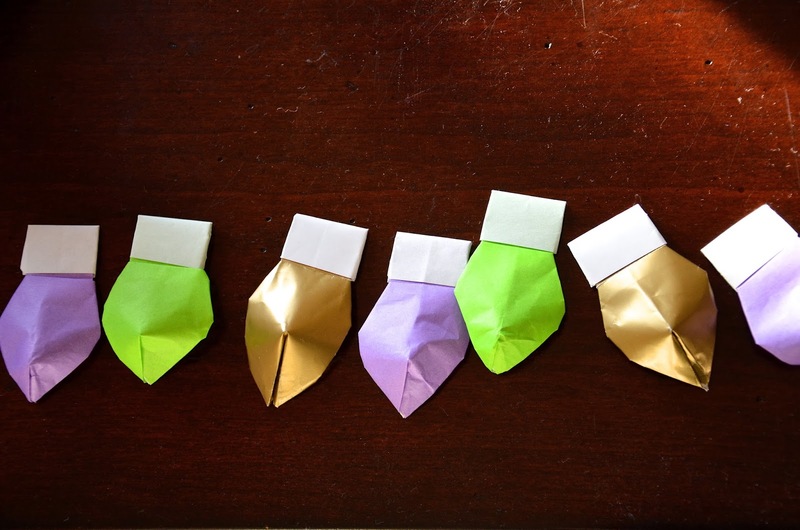 Anyway, Emily's been making these origami Christmas lights that she plans to string up into a garland to decorate the house. She's been origami-ing like there's no tomorrow. Everywhere I turn, there are little folded animals, boxes, stars, puppets . . . those little fingers of hers are never still. On the sewing front, I've made some frogs! Frog buttons, I mean, not stuffed toy frogs. I will show you soon. The Fairytale Doll Set Pattern Is (Finally) Here!